November 17, 2015 Aleppo, Syria These photos were shot in Jabal Badro, a rebel controlled district of Aleppo. 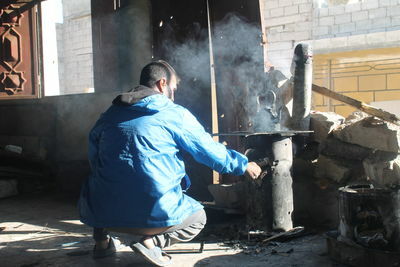 The photos show the daily struggle of the al-Saghir family as they try to insure basic needs, food and heat, in order to survive in the upcoming winter. 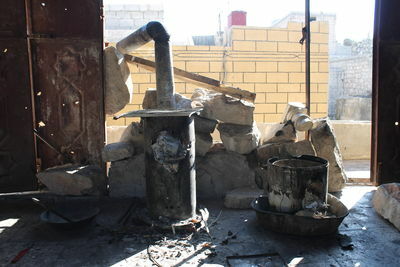 Winter is very cold in Jabal Badro, one of Aleppo’s poorest districts. Jannud al-Saghir, also called Abu Mohamed, is the father of 6 children and husband to Amina. 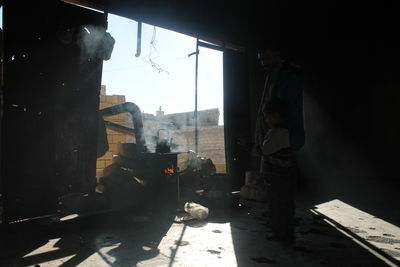 Jannud and some of his children have to make a daily trip around the area searching for items that can be burned as fuel for cooking and heating. Jannud’s mother also lives with the family. 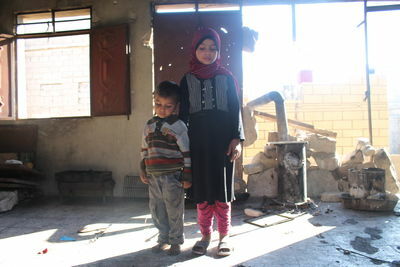 With so many family members to take care of, Jannud’s wife says they barely have enough money for food and cannot afford to buy firewood or heavy winter clothing or even make prepares to their house which was damaged in the bombing of their neighborhood in Aleppo. Amina's biggest fear is the upcoming winter. 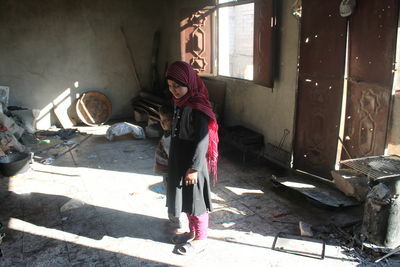 She said that her family struggled to survive last winter since because much of their clothing, blankets, mattresses and other belongings were destroyed in bombing. 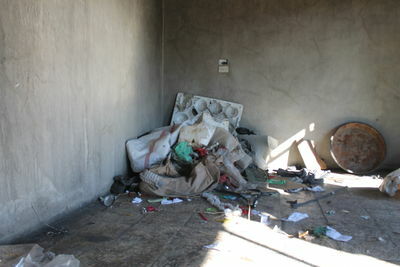 The family fled this home a few months ago but could not find suitable shelter and had to return to the house. Jannud is unemployed and is only able to earn some money from a few short construction jobs. This video was shot in Jabal Badro, a rebel controlled district of Aleppo. 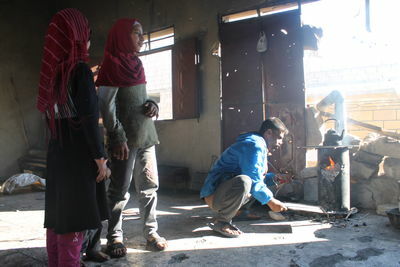 The video shows the daily struggle of the al-Saghir family as they try to insure basic needs, food and heat, in order to survive in the upcoming winter. 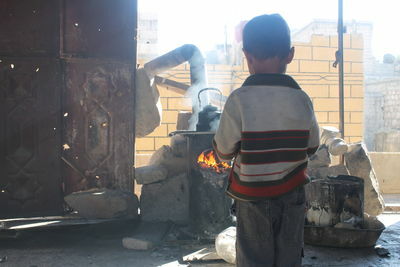 Winter is very cold in Jabal Badro, one of Aleppo’s poorest districts. 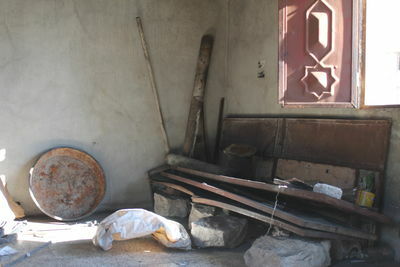 Jannud al-Saghir, also called Abu Mohamed, is the father of 6 children and husband to Amina. 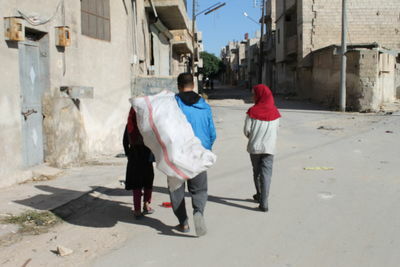 Jannud and some of his children have to make a daily trip around the area searching for items that can be burned as fuel for cooking and heating. Jannud’s mother also lives with the family. With so many family members to take care of, Jannud’s wife says they barely have enough money for food and cannot afford to buy firewood or heavy winter clothing or even make prepares to their house which was damaged in the bombing of their neighborhood in Aleppo. Amina's biggest fear is the upcoming winter. 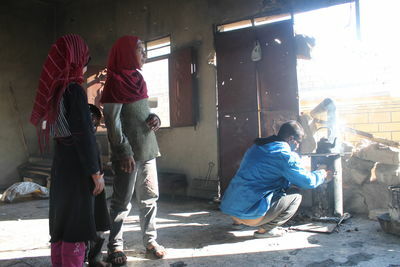 She said that her family struggled to survive last winter since because much of their clothing, blankets, mattresses and other belongings were destroyed in bombing. 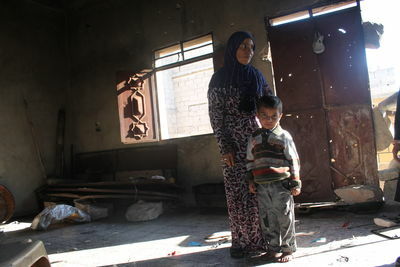 The family fled this home a few months ago but could not find suitable shelter and had to return to the house. Jannud is unemployed and is only able to earn some money from a few short construction jobs. I am very worried about the upcoming winter because last winter was tough and we struggled. 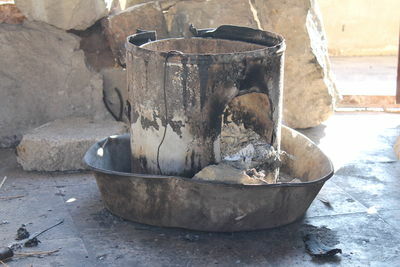 My children are very sick because we have no heater no covers no mattresses, we have absolutely nothing. 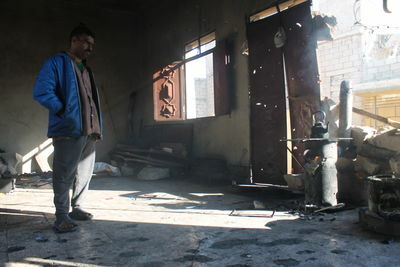 Our house was damaged in shelling and all our properties were destroyed. We are very worried about the upcoming winter. My biggest fear is the cold weather and we cannot afford to buy a heater to keep these children warm.. They don't even have winter clothing nor socks nor boots.. They have nothing at all. 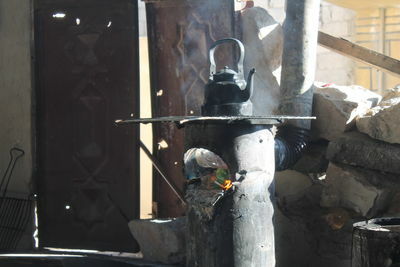 The most we need is fuel and a heater.. Last winter we felt very cold. The elderly woman here has a broken leg and when she feels cold she starts screaming out of pain. We live in very bad conditions, specially my children..They are always sick and we cannot afford to take them to the doctor or to the hospital or even pay for medication. Question: Can you explain to me what was your daily life about last winter? Answer: Since the morning my husband and my daughters go to collect plastics and rubbish.. We had some rice which I used to cook.. We had no bread.. All day I am exposed to fire and smoke.. 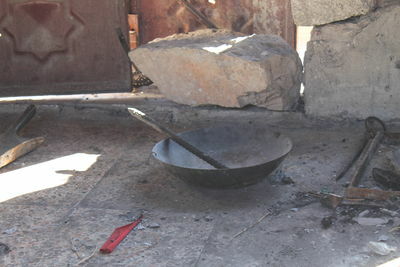 Whenever they want to shower, the girls have to go and collect rubbish [used ad fuel to light fire] as they heat water and shower we suffocate from the smell. My husband’s sister also lives here and she’s mentally disabled, she urinates in her clothing.. She knows nothing, just like a small kid. She insists on showering with cold water and she's always sick.. she’s always in a bad situation, and I am the only one to take care of her.. Our financial situation is very bad and we have no one to help us. We have nothing but this house.. and this house is really scary, it’s seriously damaged. 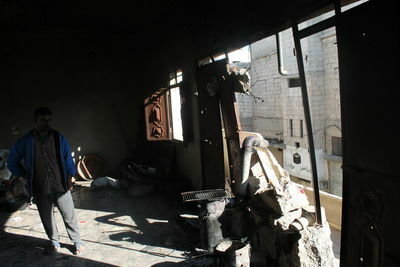 Question: Did you try to move from this place after it was damaged in the shelling? Answer: We wanted to leave. Actually we fled for only two weeks but no one was able to give us shelter.. no one could stand the children and the crowd.. We were displaced twice or three times we do not have another place to go and we cannot afford rent. Question: What was the security threat that you have been through is is shelling or what? Answer: There’s always shelling on the area.. we find shrapnels nearby frequently.. last time we found one big shrapnel just outside this house.. Sometimes we sleep in the corridor downstairs out of fear of the shelling.. When the aircraft strikes and and fly around it’s terrible, we are very scared, my children urinate in their clothing out of fear. Answer: I ask the world and the nations to interfere and find solutions for our problems. We want to rest and live in peace.. our life is very hard, we do not even feel safe to sleep. 00:00 - 00:46 Various shots of Jannud and his daughters collecting rubbish that can be burned as fuel for cooking and heating. 00:47 - 00:56 Various shots of Jannud’s house. 00:57 - 02:11 Various shots of Jannud and his family as they burn rubbish as fuel to light handmade stoves to cook and heat water. 02:11 - 02:21 Various shots of Jannud’s neighborhood. 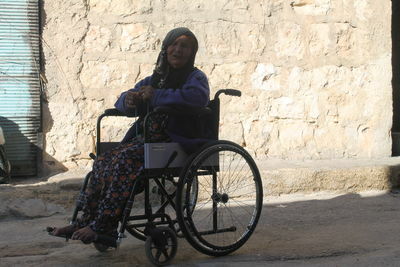 His mother, Farida, is unable to walk and is confined to a wheelchair. 02:22 - 02:33 Various shots of Jannud’s injured knee. 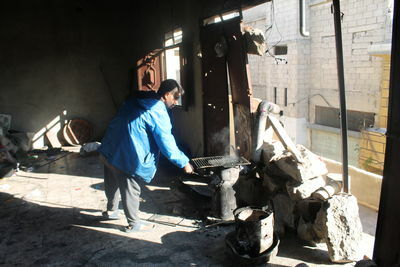 Jannud was injured in the bombing of his neighborhood in Aleppo. 02:34 - 02:43 Various shots of Jannud’s neighborhood. 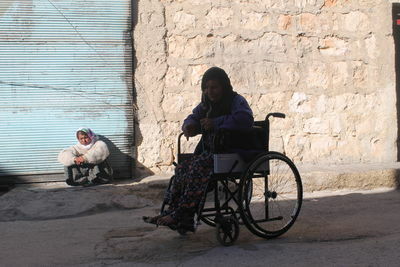 His mother, Farida, is unable to walk and is confined to a wheelchair. 02:54 - 03:48 Various shots of Jannud’s children (Areefa, Kawthar, Farida, Zeinab, Amena and Mohamed) and his wife Amena inside their house.